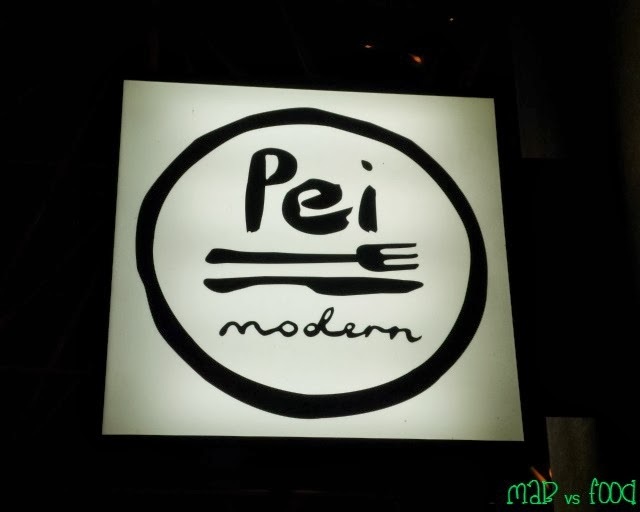 During our last night in Melbourne, my colleagues and I decided to try Pei Modern, which came highly recommended to me. Pei Modern is noted Sydney chef Mark Best's first foray onto Melbourne's dining scene. 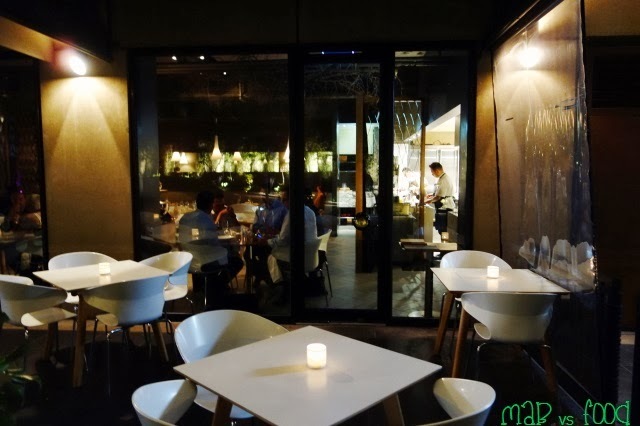 Pei Modern offers a much more casual dining experience compared to Best's flagship restaurant, Marque. Pei Modern is a modern bistro with a menu that has been designed to make the best use out of market fresh, seasonal ingredients. Pei Modern is open for breakfast, lunch and dinner and is located in the forecourt of the Sofitel Hotel. Pei Modern has its fair share of accolades including one chef hat and Best New Restaurant of 2013 from The Age Good Food Guide, and ranked 29th in Australian Gourmet Traveller 2014 Australian Restaurant Guide. Mark Best describes the food at Pei Modern as “the food I’d eat at home”. If the food is good enough for a top chef, then I am sure it is good enough for me, so bring it on! What better way is there to start off the evening than to have some fancy fish fingers. 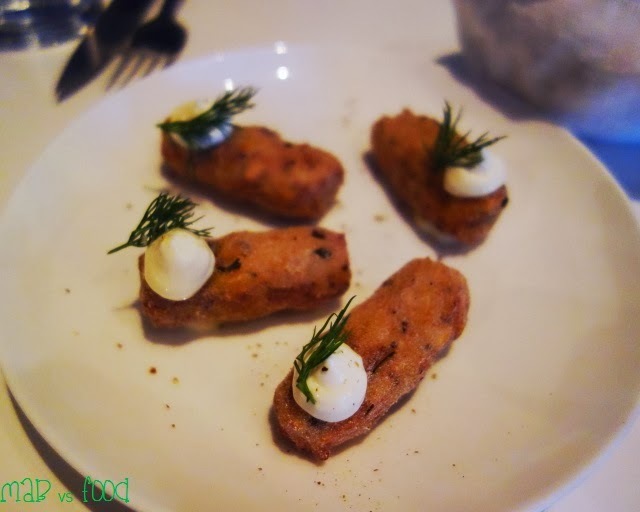 I do love a good croquette and these salt cod croquettes really hit the spot. They were crispy and didn't feel too greasy. And they came with a nice tartare sauce and a sprig of dill. For entree we decided to share the tomato carpaccio and scallops. 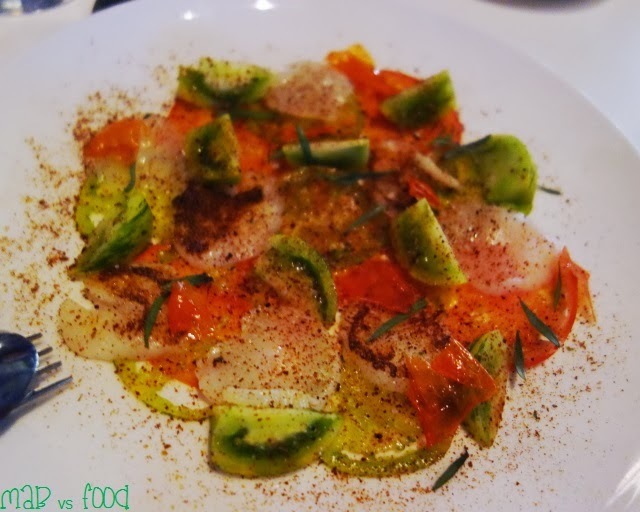 This is my kind of entree: simple, fresh, light and nice balance of flavours. The scallops were thinly sliced and lightly seared to give the scallops a nice smokey flavour that goes so well with the lightness and sweetness of the scallop. I am a tomato addict and there were an assortment of tomatoes on display, so this course was demolished in no time! 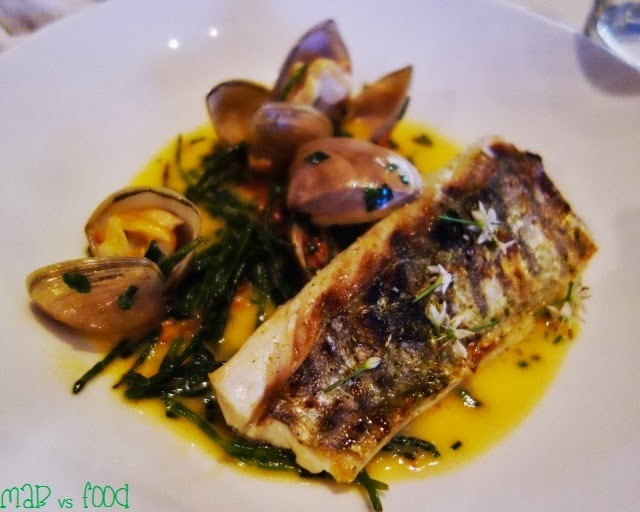 For main course, I decided on the Spanish Mackerel, clams and samphire. Again, I loved the simple presentation of this course and how all the components of this dish are so well cooked and come together to make a great dish. The Spanish Mackerel is not my usual preferred fish, as it is firm fleshed and often comes out dry, but I quite enjoyed this one as the flesh was still reasonably moist. I loved the clams! They were sweet, salty and succulent little things! 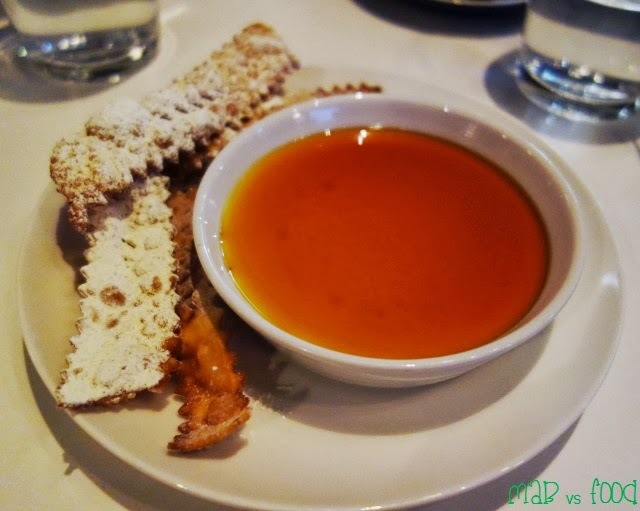 But for me its the buttery, garlicky sauce that brings the whole dish together. And the samphire adds saltiness and texture to the dish. And as a side, we decided to go for a customary bowl of chips. But what we didn't expect was how amazing Dobson's chips were going to be. My colleague described these as "the best chips"! And I described these as tasting like "real potatoes" then a discussion about hot chips ensued. Don't all chips use real potatoes? 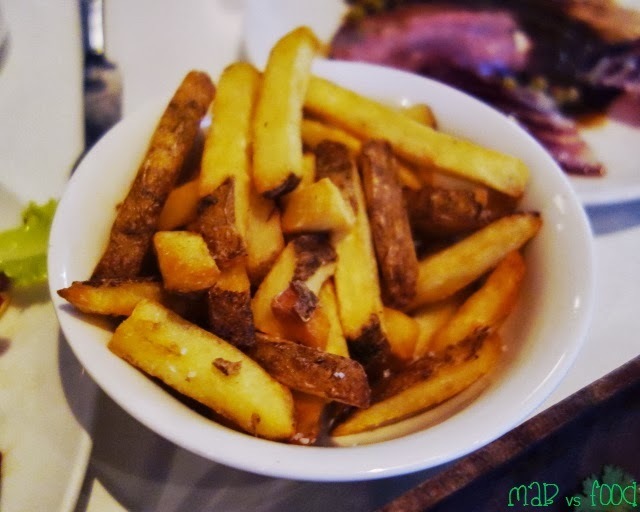 These chips ticked all the boxes: crisp on the outside, piping hot, fluffy potato on the inside and the skins left on, the tastiest part of a potato. We also ordered a customary bowl of salad. 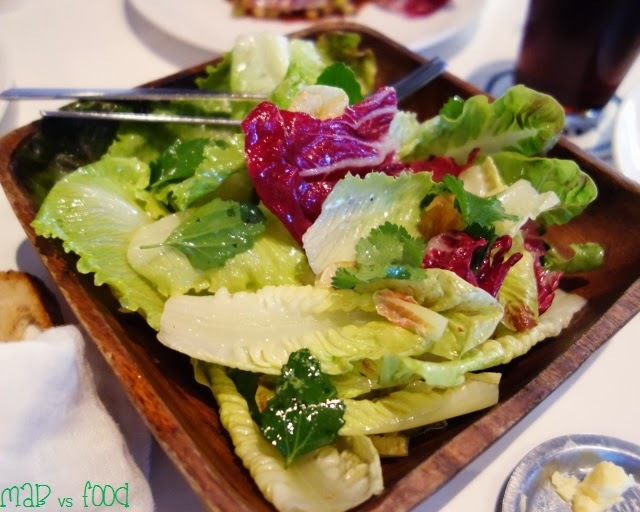 The leaf salad was fresh, crisp and well dressed with vinegar and olive oil. For dessert, I decided to go with Sauternes custard, which is a Mark Best signature at Marque. The difference is that he serves it in an egg shell with its top neatly cut off at Marque and you get a whole bowl of custard here. There is quite a big whack of alcohol from Sauternes, but the custard is incredibly smooth and creamy. It was also really moreish, and so tasty when you dip the crispy crostoli into it. Overall, the service at Pei Modern was excellent throughout the night and the food was great, of course. And it wasn't overly expensive either. The meal worked out to be just over $60per person and considering the quality of the food, I thought it was great value. I will definitely be making Pei Modern a regular fixture in my Melbourne trips, just like Cecconi's. Highlight: Dobson's chips are the best chips in town! Lowlight: Dark, noisy venue. And white plastic seats are not the most ergonomic.